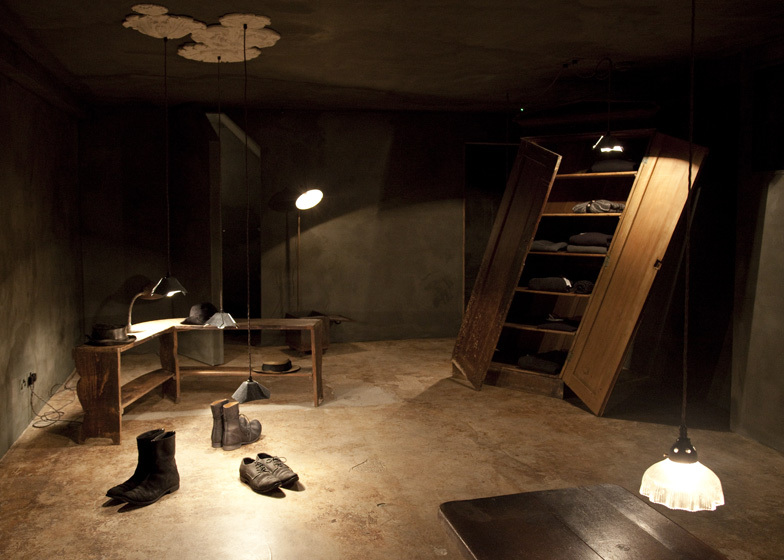 British design studio JamesPlumb has created a dimly lit showroom filled with antique furniture in the basement of east London menswear store Hostem (+ slideshow). 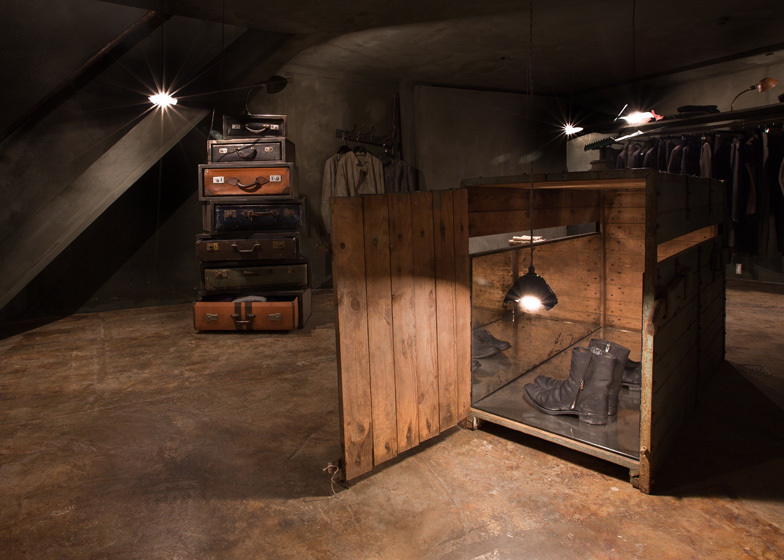 Following their earlier refit of Hostem's shop floor, James Russell and Hannah Plumb were asked to redesign the shop's subterranean level to provide a quieter space for displaying the brand's most important collections. "We wanted the space to be different from upstairs: a discreet addition for the store's most cherished goods," Russell told Dezeen. 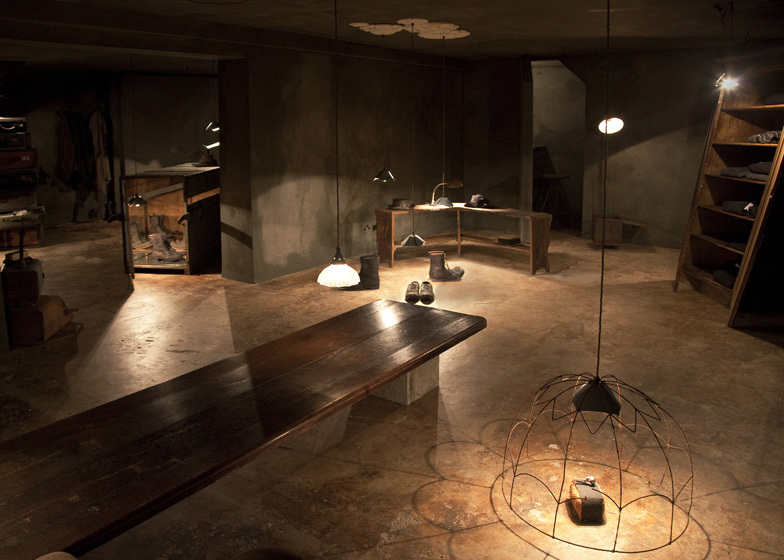 "We opened the space up, painted it dark and dimmed the lighting; this created a calmness by making the corners and edges of walls disappear." 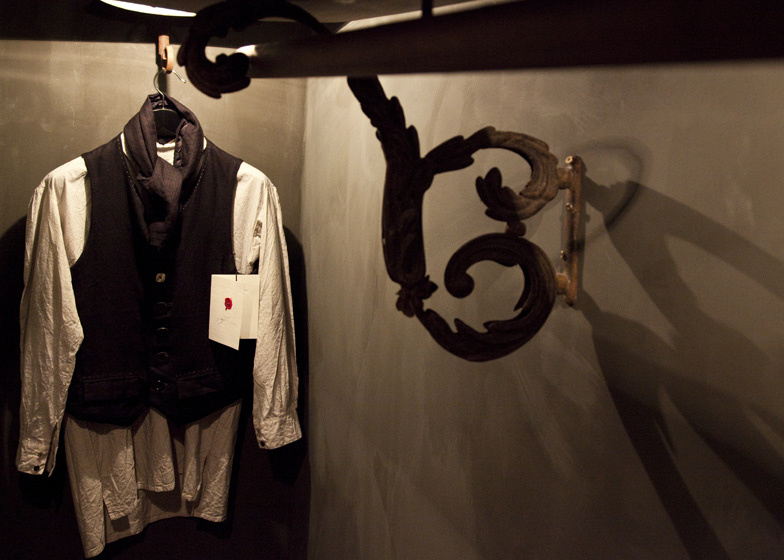 The designers added a few unique furniture pieces for displaying different garments and accessories. 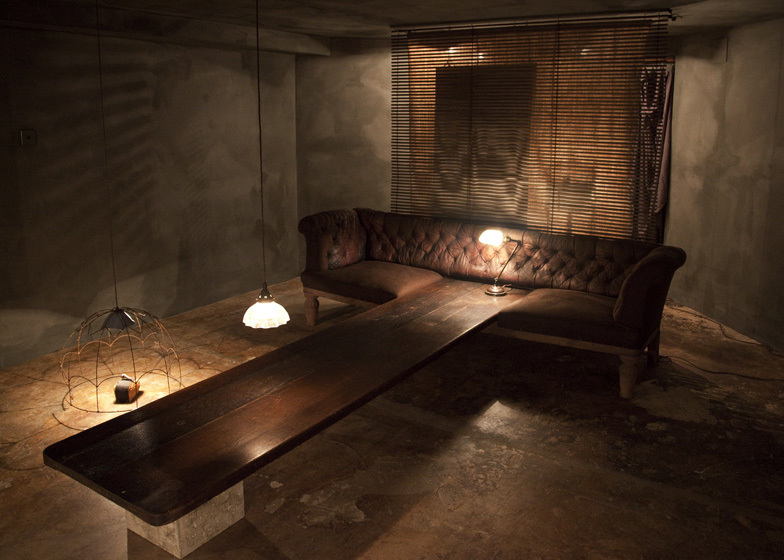 These include a wardrobe that appears to be collapsing and a Chesterfield sofa with a table growing out of its centre. "Our work often starts with things we love that are broken and damaged," explains Russell. 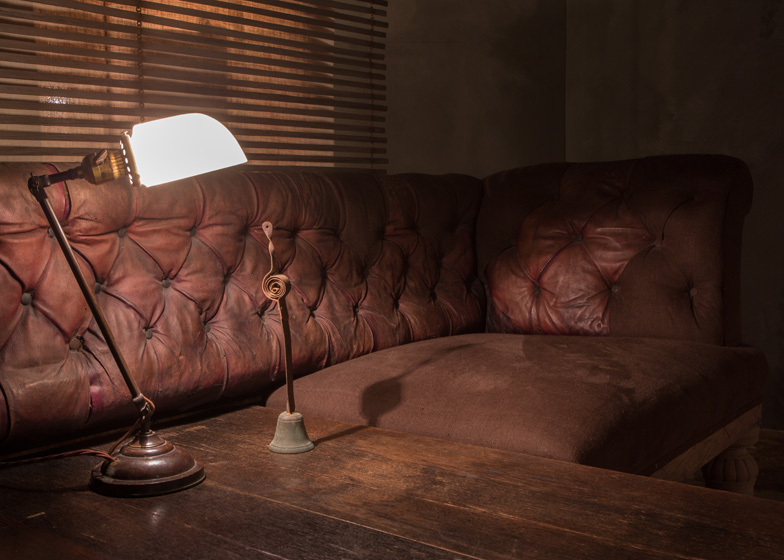 "When we found the sofa it had no seat and was just this filthy rotten leather, but we didn't want to just reupholster it into another Chesterfield, we wanted to celebrate it." 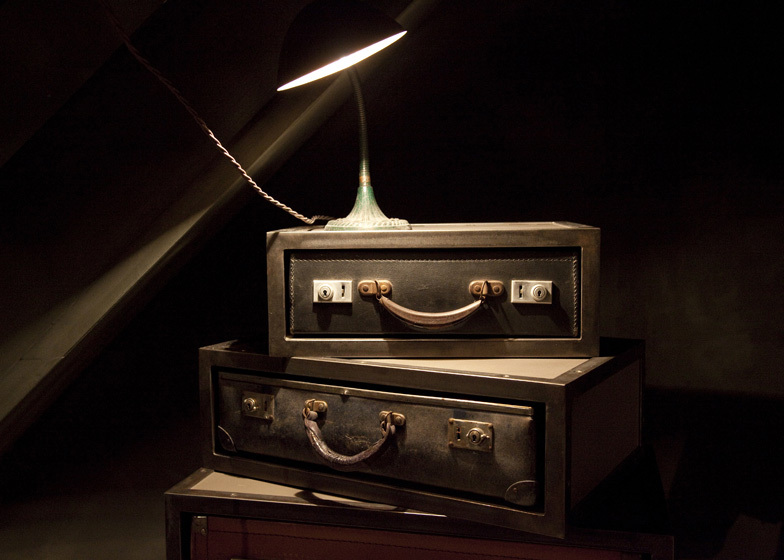 Other furniture pieces include a Wurlitzer harp case converted into a display case for a single garment and an old crate formerly used for the transportation of pigs. 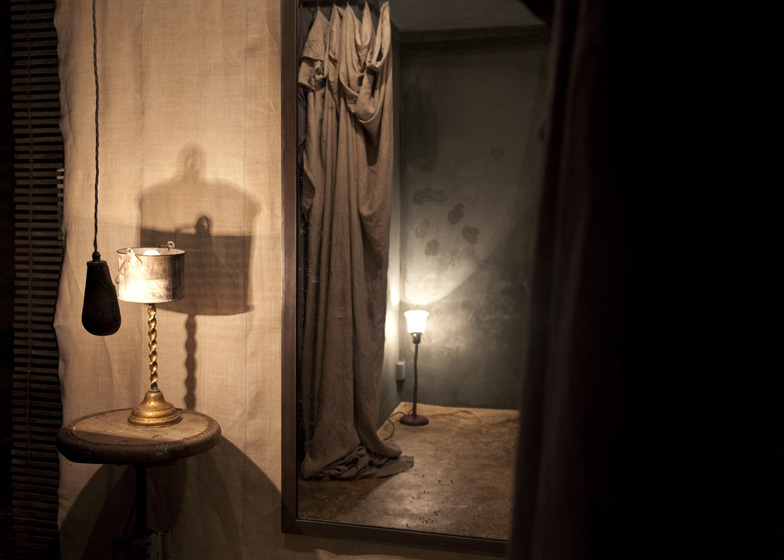 There's also a fitting room, screened behind a thick layer of draped fabric. 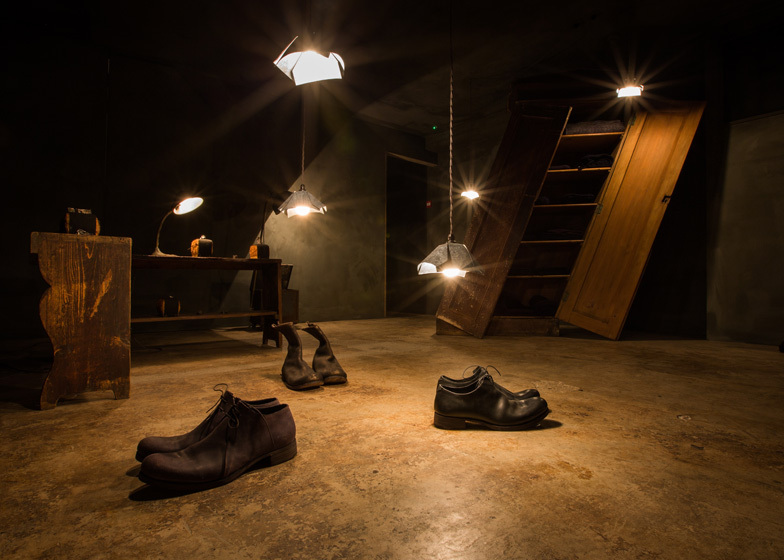 The Chalk Room is currently dedicated to Hostem's bespoke service, which provides made to measure clothing and accessories, but shoppers can also order furniture by JamesPlumb. 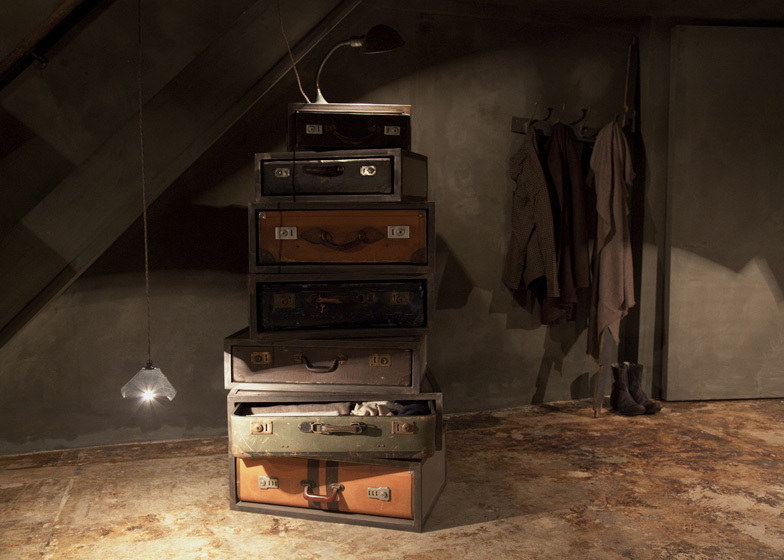 This includes chests of drawers made from stacks of suitcases and chandeliers made from clusters of antique lampshades. 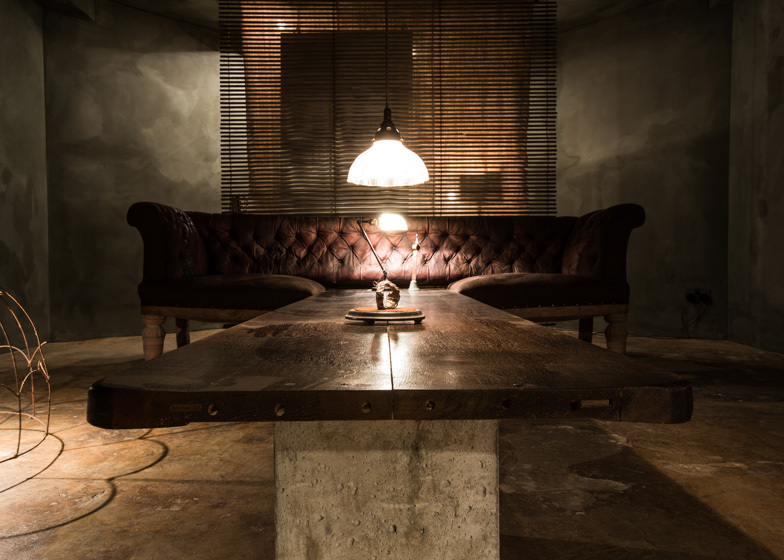 JamesPlumb designed the original interior for Hostem in 2010. The project won the retail category at the inaugural Inside awards and Dezeen interviewed Russell and Plumb about their design as part of the event. See more design by JamesPlumb, including the brand's most recent collection. 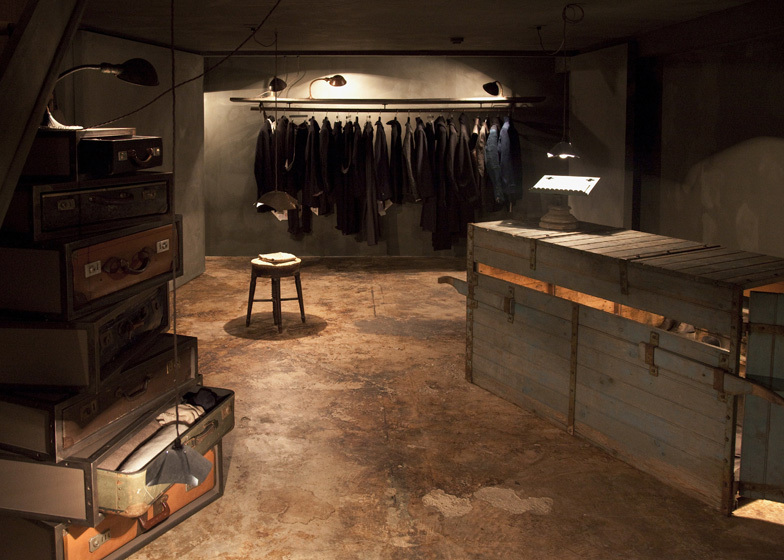 JAMESPLUMB created this discreet addition to their award winning interior design for menswear store Hostem in East London. 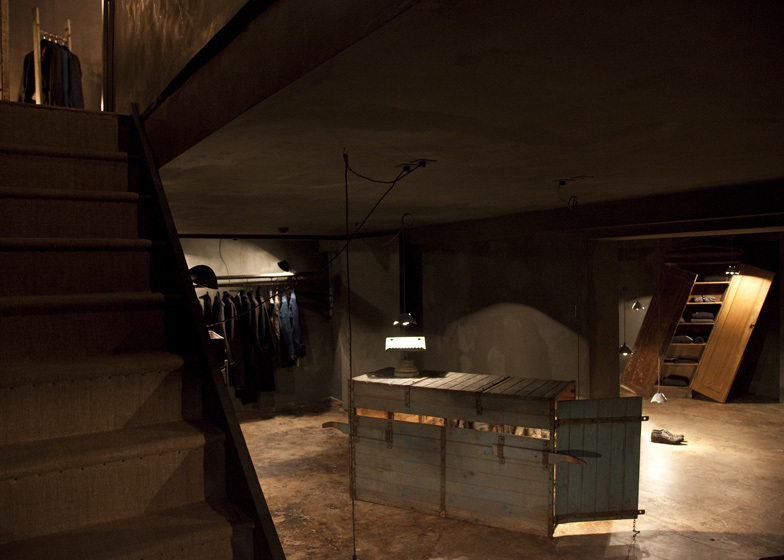 Briefed to create an environment to celebrate the craft and skill of the store's most cherished designers, they created a quietly removed space, downstairs from the main showroom. 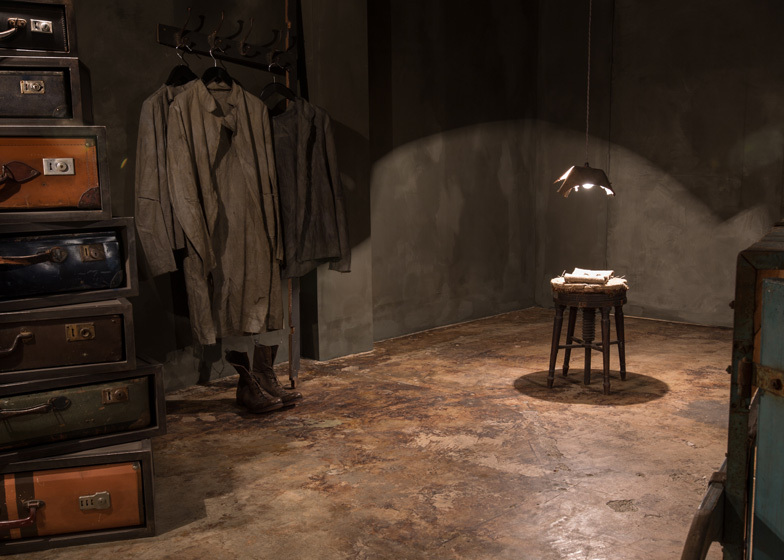 A brand new collection of one off assemblage form the perfect theatrical showcase - including an antique Wurlitzer harp case transformed into a wardrobe for a single garment, a weather worn Chesterfield married with a table, and a crate formerly used for carrying pedigree pigs, that now presents handmade footwear.